Hummingbirds are fascinating creatures! Their tiny size, quick movements, and beautiful colors amaze and delight us. Creating a hummingbird garden that has all the elements of their native habitat can entice them into visiting your yard, and maybe even making their home there. Encourage these tiny, delightful birds to live in your yard by filling your landscape with plants, perches, and other features that will supply their needs for food, water, and shelter. You’ll also have a beautiful backdrop for taking photos or videos of your hummingbird visitors! Planting flowers that smell sweet isn’t the key to attracting hummingbirds, since their sense of smell is weak. Hummingbirds aren’t attracted by the flowers’ fragrances, but by their visual appearance, to feed on the nectar the flowers produce. Plants with orange, red, trumpet-shaped, or tubular flowers are the most appealing to them. You can plant sweet-smelling flowers along with your hummingbird-attracting flowers if you want to please yourself and add interest to your garden, though! Columbine, cardinal flowers, nasturtium, petunias, coral bells, dahlia, foxglove, fuschia, monarda, daylilies, geraniums, lilacs, azaleas, verbena, Rose of Sharon bush, butterfly bush, honeysuckle vines, and trumpet vines are just a few hummingbird favorites. Choose a variety of flowering plants, shrubs, vines, and trees that will bloom successively throughout the season to ensure a continuous supply of nectar. 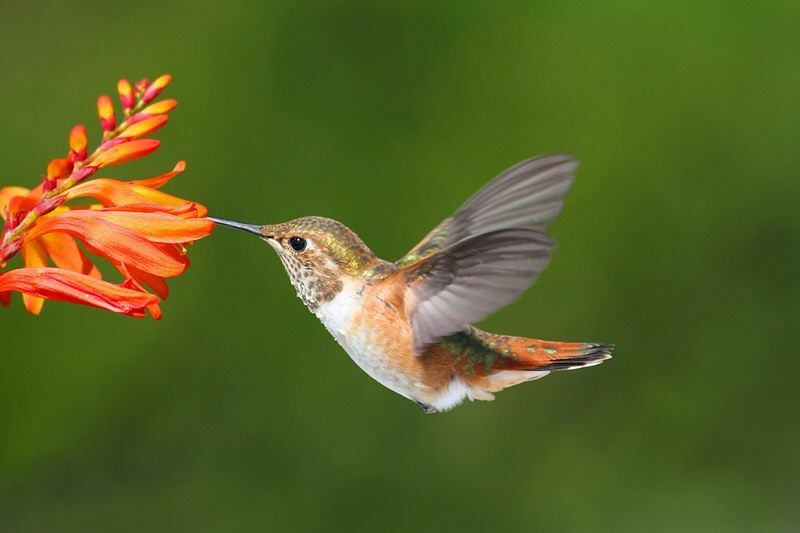 Nectar provides the carbohydrates for the energy hummingbirds need, but they also feed on spiders and soft-bodied insects for the protein they contain. Don’t use chemical pesticides or herbicides in your hummingbird garden. The toxic chemicals may be harmful to these tiny birds, and if you eliminate the insect population, you’ll reduce your chances of having hummingbird visitors drop in. Use organic gardening methods to keep garden pests and diseases under control. Some hummingbird lovers will even place over-ripe fruit in their hummingbird garden to help attract flies as a food source! You’ll also want to provide hummingbird feeders for times when flowers aren’t in bloom. Hummingbirds are territorial, and hanging two or more small feeders, instead of one large one, can help prevent aggressive behavior. The syrup in hummingbird feeders is only a supplemental food source, and the birds will migrate when the insect population drops below what they need to survive (although some species may decide to stay over winter in milder climates). As long as you see hummingbirds visiting your feeder, keep refilling it. There are many different types of hummingbird feeders, and you don’t need to buy the fanciest model. The saucer-shaped feeders will be easier to clean than the cylindrical types. If you notice hummingbirds hovering around the feeder you have chosen, but not feeding, don’t assume they just don’t like the feeder or the syrup. They may be used to another type of feeder, or may have never seen one, and may need time to figure out how to use it! You can buy hummingbird syrup, but it’s easy to make your own hummingbird syrup by mixing one part cane sugar with four parts water. It’s not necessary to boil the solution if you refill the feeders daily. Otherwise, boil the mixture to kill bacteria and slow down spoilage, let it cool, and store the leftovers in the refrigerator for up to two weeks. You don’t need to add red food coloring to the syrup; there is some concern that the food coloring may be harmful to the birds, and most hummingbird feeders are made of orange or red plastic, which will attract the birds to them. Dispose of any syrup that becomes cloudy. Hummingbirds have enough sense not to drink spoiled syrup, and will look for fresh food elsewhere, so keeping your hummingbird feeders clean is a must! Change the sugar syrup in the feeder every few days if the birds don’t drink it all, or if the syrup turns cloudy. In hot weather you should change the syrup daily. Rinse the feeders in hot water each time you change the syrup. If mildew becomes a problem, soak the feeder in a weak bleach solution, and rinse it thoroughly before refilling it with syrup. Hanging the feeders in the shade will slow down spoilage and mold growth, but the feeders will be easier for individual birds to spot if they are placed in a sunny location. Don’t worry about the feeders encouraging the birds to stay too long into the fall. As long as there are hummingbirds visiting your feeder, keep filling it. Hummers seldom use a standard birdbath to bathe in the manner of most other birds, although they may splash in shallow, moving water. They prefer to fly through a cool mist or perch at the edge of a fountain and let water sprinkle on them. Add a fountain with an upward spray to your birdbath, or install a misting water feature for your hummingbirds’ bathing enjoyment. Hummingbirds spend most of their time perching, when they’re not feeding or settling territorial issues. Hummingbirds do have feet, despite a common misconception! Their feet just aren’t designed for efficient walking; it’s easier for them to fly a few inches. Hummers will perch on tree twigs, flower stems, and even clothes lines. Hummers prefer to build their nests in places that are protected from the wind, to prevent their tiny chicks from being tossed out, but they won’t live in a covered birdhouse. They usually choose the forked lower branches of a tree, or you may find hummingbirds nesting in sheltered porch/patio fixtures, an open tool shed, or other sheltered spot. Some hummingbird species like to nest under the eaves of houses, and you can encourage them to nest there by attaching a “Hummingbird House” in this sheltered location. The Hummingbird House is an open, forked platform upon which to build a nest. It has attached cotton tufts for building material (to give the nesting bird a head start), although the hummers will collect more natural material to add to it. Favorite nesting materials include plant fibers and down, moss, and spider webs. By nature, hummingbirds prefer rural areas to city living, but a well-designed hummingbird garden may still attract these delightful little creatures to your yard if you live in a suburb. There are many online resources available to help you create an inviting habitat that hummingbirds will be glad to call home for the season! Hey Buddy!, I found this information for you: "Tips for creating a hummingbird garden". Here is the website link: http://backyardbirdingblog.com/tips-for-creating-a-hummingbird-garden/. Thank you.